My first encounter with Pier Paolo di Fiore dates back to 2002. It was a memorable dinner at the FEBS meeting in Istanbul that sparked the start of an interesting and productive collaboration. Our conversation revolved around the question why and how ubiquitination regulates internalization and trafficking (=endocytosis) of active growth factor receptors. We shared the same scientific enthusiasm and engaged in quite stimulating discussions that were continued during the visit to the blue mosque (and admittedly hampered our capacity to appreciate its cultural beauty). In the following year our labs reported a common work showing that epidermal growth factor receptors (EGFRs) are multiply monoubiquitinated and that this modification determines the kinetics and fidelity of the endocytic process. Threshold-controlled ubiquitination of the EGFR directs receptor fate..
How the cell converts graded signals into threshold-activated responses is a question of great biological relevance. Here, we uncover a nonlinear modality of epidermal growth factor receptor (EGFR)-activated signal transduction, by demonstrating that the ubiquitination of the EGFR at the PM is threshold controlled. 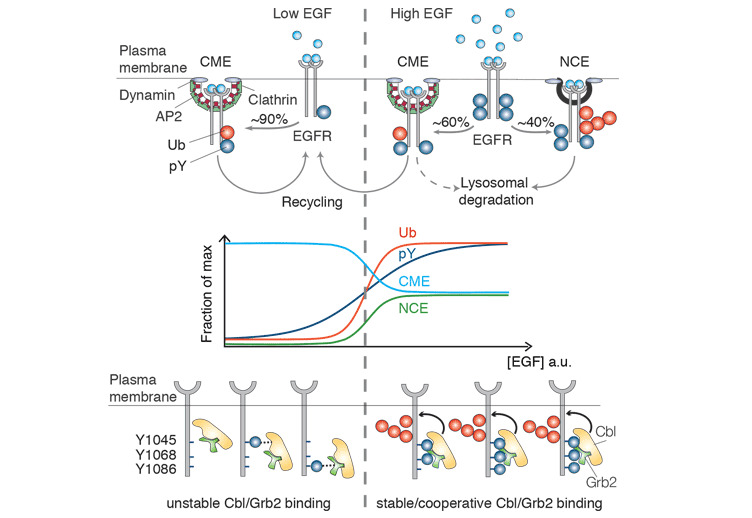 The ubiquitination threshold is mechanistically determined by the cooperative recruitment of the E3 ligase Cbl, in complex with Grb2, to the EGFR. This, in turn, is dependent on the simultaneous presence of two phosphotyrosines, pY1045 and either one of pY1068 or pY1086, on the same EGFR moiety. The dose-response curve of EGFR ubiquitination correlate precisely with the non-clathrin endocytosis (NCE) mode of EGFR internalization. Finally, EGFR-NCE mechanistically depends on EGFR ubiquitination, as the two events can be simultaneously re-engineered on a phosphorylation/ubiquitination-incompetent EGFR backbone. Since NCE controls the degradation of the EGFR, our findings have implications for how the cell responds to increasing levels of EGFR signalling, by varying the balance of receptor signalling and degradation/attenuation. What is endocytosis and what makes us so enthusiastic about it? In simple words endocytosis is a logistics process committed to the transport of plasmamembrane proteins and different types of extracellular molecules to the inside of the cell followed by the shuttling to their intracellular destinations. This process is often ligand-induced, i.e. happens only when a ligand interacts with its cognate cell surface receptor. This type of internalization is observed for signalling receptors (e.g. the receptors for hormones, growth factors or cytokines) that trigger an intracellular signalling cascade upon binding to an extracellular ligand ultimately leading to a certain cellular response. Internalization of these activated receptors serves primarily to extinguish the signal by removing the signalling receptor through lysosomal degradation. This is crucial to avoid overstimulation of the cell that would cause serious problems such as malignant transformation. An important signal that drives lysosomal targeting of the plasma-membrane receptors is provided by ubiquitin, a small molecule that is attached to the activated receptors. Those receptors that escape ubiquitination are recycled back to the plasmamembrane and can be activated again. A seminal theme - and here the excitement starts - is the unexpectedly tight connection between endocytosis and signalling: It is thought that the receptor, being associated with its ligand and thus active, continues to emit signals inside the cells until it reaches the lysosomes. These signals are distinct from those emitted from the cell surface and have thus distinct outcomes. Importantly, there are different routes that the ligand-activated receptor can take to enter and travel inside the cell and it became clear that the very early decision which way to go will impact on receptor signalling. For a very long time our understanding of these internalization routes was very simplistic. Yet, by combining computational modelling, experimental work and a very original, unbiased view Paolo has challenged and significantly expanded the canonical knowledge. In his pioneering work on the endocytic adaptor Eps15 he shed light on the molecular mechanism that governs the Ub-dependent transport of activated receptors towards the lysosome. He was also the first one to question the ingrained notion that the Clathrin-dependent entry route required ubiquitination of the activated EGFR. Instead, he proposed that ubiquitination provided a short-cut signal to destruction via a Clathrin-independent pathway. In Paolo&apos;s recent paper (EMBO J, 2013) his team has described the mechanism that creates a switch-like degradation signal from a graded signal, i.e. explains how a cell that is exposed to variable concentrations of extracellular ligand ensures a sharp response (ON/OFF) to the signal. Phosphorylation-dependent ubiquitination of the EGFR constitutes the heart of this process. Only if the concentration of EGF is sufficient to ensure phosphorylation of two specific sites within one receptor molecule, i.e. the threshold concentration is reached, the Ub ligase Cbl can be recruited to ubiquitinate the receptor, the ultimate signal that drives rapid lysosomal degradation. Receptors that do not fulfil the criterion are directed to a clathrin-mediated entry portal and remain much longer in a signalling-competent mode. This and previous discoveries of Paolo&apos;s group have important biological implications as endocytosis and signalling are inseparable processes. It has become clear that alterations in the endocytic program are indeed implicated in diseases that include cancer, infectious diseases, immune system disorders and neurodegenerative diseases. 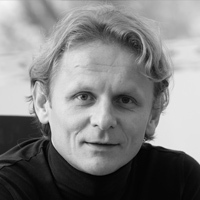 Paolo&apos;s work has set the stage for manipulating the endocytic process to obtain a desired outcome. On the way there, a number of exciting unresolved issues await their solution: For example, how the ubiquitinated receptor is coupled to the non-clathrin mediated endocytic pathway and whether threshold-controlled ubiquitination functions as a switch for other signalling molecules as well. Top, pathways of EGFR internalization at low and high EGF concentration (CME, clathrin-mediated endocytosis, NCE, non-clathrin endocytosis). Middle, schematic representation of EGFR ubiquitination (Ub), phosphorylation (pY) and endocytic routes, as a function of ligand concentration. 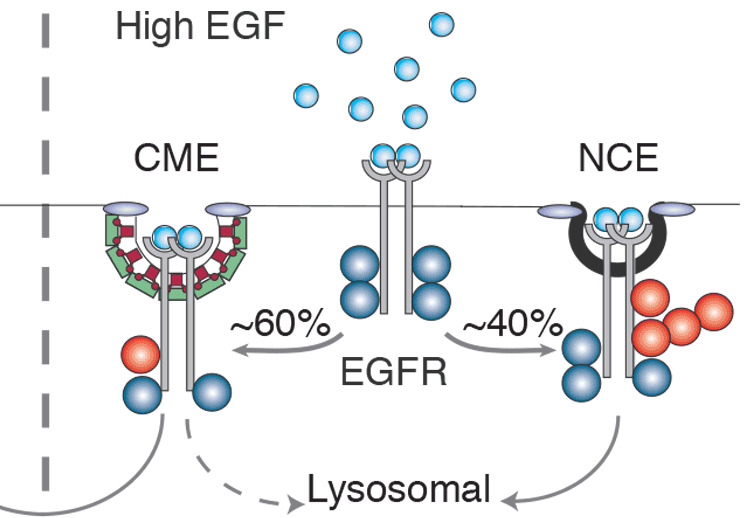 Bottom, cooperativity mechanism responsible for the EGFR-Ub threshold. Three phosphotyrosines (pYs) are critical for the cooperative recruitment of Cbl to active EGFR: pY1045 binds directly to Cbl, pY1068/pY1086 bind indirectly to Cbl:Grb2 complex.